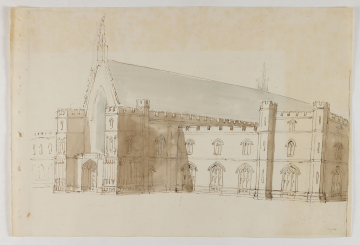 The drawing appears unrelated to any other Gothicising scheme, in that the New Law Court’s northern extent is taken back to the penultimate northern bay of Westminster Hall. Such a proposal would have necessitated the total demolition of the Court of King’s Bench and most of the Bail Court. The corner tower shown here would therefore be that of the return wing of the Stone Building, tricked out with polygonal corner turrets and Gothic windows. The idiom adopted, with large six-light windows to the ground floor set in recessed arches with quatrefoil friezes beneath, appears closer to the manner of James Wyatt than to Soane.